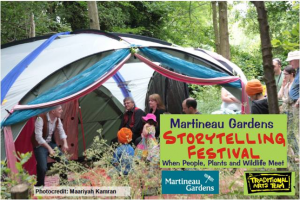 Just over a week to go until the return of our 4th Storytelling Festival on Saturday 20 June (11am – 7pm) with the Traditional Arts Team. As midsummer approaches, spend the day relaxing in our beautiful, therapeutic Community Garden; enjoy a day of storytelling performances, story trails, live music, dance, arts, stalls, and crafts for children with delicious food from ChangeKitchen and as the evening draws to a close, gather round the fire for campfire tales. For the latest details (and ticket availability), please visit the main Festival Webpage.